Contemporary social and cultural life is increasingly organised around a logic of self-transformation, where changing the body is seen as key. 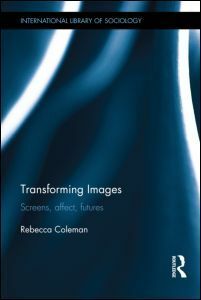 Transforming Images examines how the future functions within this transformative logic to indicate the potential of a materially better time. The book explores the crucial role that images have in organising an imperative for transformation and in making possible, or not, the materialisation of a better future. Coleman asks the questions: which futures are appealing and to whom? How do images tap into and reproduce wider social and cultural processes of inequality? Drawing on the recent ‘turns’ to affect and emotion and to understanding life in terms of vitality, intensity and ‘liveness’ in social and cultural theory, the book develops a framework for understanding images as felt and lived out. Analysing different screens across popular culture – the screens of shopping, makeover television programmes, online dieting plans and government health campaigns – it traces how images of self-transformation bring the future into the present and affectively ‘draw in’ some bodies more than others. Transforming Images will be of interest to students and scholars working in sociology, media studies, cultural studies and gender studies.